Bog Sage (salvia uliginosa)- Also known as Brazilian Bog Sage or Blue Spike Sage. Prolific bloomer features dainty pastel blue flowers with white throats born on tall stalks. Slender green leaves and tall flower spikes give this plant a bamboo-like appearance. Beautiful cottage garden plant, blooming all summer long, needs plenty of room as it can quickly grow up to 4' tall and wide in one growing season. Not fussy about soil conditions, despite the name, it is quite drought tolerant once established. Perennial in zones 7-11. Live plant in 3 inch container. My plants arrived quickly and in great condition. 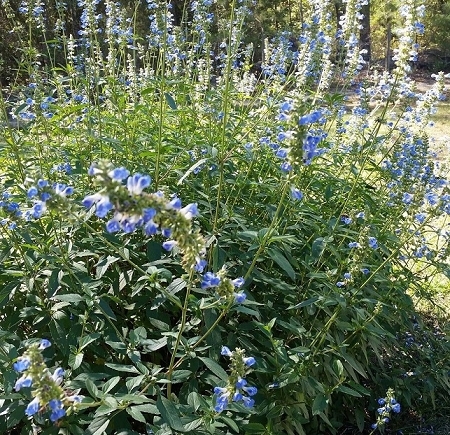 I have the Bog Sage planted in a part-shade flower bed. It seems to like its new home and is growing very fast. I cannot wait for it to bloom.